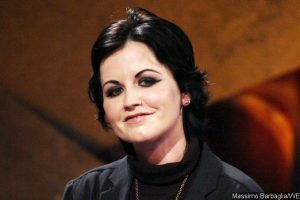 AceShowbiz -Late The Cranberries‘ frontwoman Dolores O’Riordan is to be immortalised with a sculpture in her home city of Limerick, Ireland. The “Zombie” singer passed away a year ago on Tuesday, January 15 at the age of just 46, and now her family have entered talks with city officials to build a permanent memorial to her. The city’s mayor Daniel Butler plans to name a new public square used for arts events after the Irish rocker, in which he suggested placing a stone sculpture of the sofa used in the cover art for several of The Cranberries’ albums. However, he suggested Dolores’ bandmates Noel Hogan, Mike Hogan and Fergal Lawler and family should decide what form any permanent tribute takes. Eileen said she had been discussing plans for a possible museum with Niall, Noel and Mike, but worried it would be difficult to maintain permanently. The Cranberries have recently released their first new music since Dolores’ tragic accidental drowning in the bathtub of a London hotel. The song, “All Over Now”, is the first single from a final album, “In the End”, featuring vocals she recorded before her death.